Before Rabbi Yosef Yitzchak left the Soviet Union for Riga, the Latvian capital, on the 24th of Tishrei, 5688 (October 20, 1927), he presented the authorities with a list of people for whom he wanted exit visas. Naturally, this list included Rabbi Menachem Mendel Schneerson - his future son-in-law. However, Rabbi Menachem Mendel only joined Rabbi Yosef Yitzchak several weeks later. He had decided to spend the High Holy Days with his parents in Dnepropet­rovsk. Evidently, he had a premonition that this would be his last meeting with his father, and that twenty years would pass before he saw his mother again. That year, the Simchat Torah celebration in Dne­propetrovsk entailed the kind of genuine, uplifting, all embracing joy that defies rationality, enfolding everyone who came in contact with it. Five days after the holidays, Rabbi Menachem Men­del left for Leningrad, and from there he continued on to Riga. His mother, Rebbetzin Chana, accompanied him as far as Leningrad. Many years later, she would recall this jour­ney: "We were traveling in a stifling, crowded train, sur­rounded by simple folk - peasants, soldiers and workers. At that time, the anti-Semitism was so great that a Jew was not safe in a train carriage, even if he did nothing to draw atten­tion to his Jewishness. Nevertheless, when it was time for the morning prayer, my son rose, took out his tefillin, and put them on. I was seized by fear. I was afraid that he would be beaten or, even worse, thrown off the moving train. Yet an amazing thing happened: several people got up and formed a circle around my son. They continued to stand guard over him until he completed the prayer and removed his tefillin. This was a true miracle!" About a year later, on the 14th of Kislev, 5689 (1928), Rabbi Menachem Mendel married the middle daughter of Rabbi Yosef Yitzchak, Chaya Mushka. Among Chassidim a wedding in the Rebbe's family is seen as a momentous occasion that concerns not only his family but also every Chassid and every Jew. On that day, everyone rejoices as if it were his or her own wedding. Even though the Rebbe was residing in Riga, it was decided to hold the wedding in Warsaw - one of the greatest centers of Judaism at the time - to enable the maximum number of people to attend. The Tomchei Temimim Chabad Yeshiva was also located in Warsaw, an additional reason to hold the wedding there. It is said that before the chuppah, the Rebbe, Rabbi Yosef Yitzchak, had a private conversation with the groom, after which he tied a prayer sash around him and said, "Now that you are marrying my daughter we are truly bound to one another, both in this world and in the world to come." The wedding was one of the most magnificent festivi­ties in the history of Polish Jewry. Thousands of guests sang and danced until they were ecstatic with joy. The celebration continued until the early hours of the morning. From time to time, Rebbe Yosef Yitzchak would stop the dancing to deliver a speech, which inspired the dancers to new heights. Actually, the wedding was celebrated in two places. Hundreds of miles away, in Dnepropetrovsk, Rabbi Men­achem Mendel's parents were holding another wedding celebration. Rebbetzin Chana described it as follows: "On the day of the wedding, all the relatives, friends and ac­quaintances that lived in the vicinity began to arrive at our house. Representatives of the city's Jewish community brought a huge cake inscribed with the names of the most respected members of the community. At that time, any contact with a leader of a religious community could not only damage a person's social position and ruin his career, but also land him in Siberia or in prison. Nevertheless, at least three hundred people came to congratulate us. Amaz­ingly, despite the draconian censorship of the times, on that day the authorities suspended their own order to confiscate telegrams addressed to the Schneerson family; they even made a special exception and allowed the post office to re­lease telegrams written in Hebrew (in Russian translitera­tion), despite the strict ban on use of the Hebrew language. The fiddler was playing wonderful music, people were dancing on the tables until dawn, but our joy was incom­plete. We may have been singing and celebrating, but our eyes were filled with tears. Our hearts were anguished, for we were denied the happiness of being with our son on his wedding day, and somehow we knew it would be a long time before we saw him again." Immediately after the wedding, Rabbi Menachem Mendel and his young wife left Warsaw for Berlin. At the University of Berlin, he earned doctoral degrees in several fields, including physics, engineering, and philosophy. Leaving the world's largest Chassidic center, being uprooted from her home, and following her husband to a strange city required considerable sacrifice on the part of Rabbi Menachem Mendel's young wife. Her world shrank to the size of their tiny one-bedroom apartment. One of the few people who knew Rabbi Menachem Mendel in Berlin recounts that the rabbi would occasionally join him at his table at the local kosher restaurant. "He never engaged in petty conversation or small talk," recalls the man. "He never discussed the food, as is often done by res­taurant customers. He ate, but it was as if the food did not exist for him. Usually he was silent, and when he did talk, it was only about the Torah." Another Jew, who attended the University of Berlin together with the future Rebbe, relates: "The university had many Jewish students, yet he was the only one who wore a yarmulke and a beret despite the strict German university rules that forbade the wearing of any headgear during lec­tures. In the lecture hall, he usually sat on the last bench, holding an open Talmud on his knees." While living in Berlin, Rabbi Menachem Mendel kept up a regular correspondence with his father-in-law, and vis­ited him on several occasions. In the fall of 1929, Rabbi Yo­sef Yitzchak came to New York for the first time, while Rabbi Menachem Mendel replaced him in Poland, presiding over the Rosh Hashanah and Yom Kippur farbrengens. In the winter of 1933, when the Nazis came to power in Germany, Rabbi Menachem Mendel and his wife left Berlin for Paris. They rented a small one-room apartment in the city center. He enrolled at the Sorbonne (where he stud­ied physics), and at the Polytechnic Institute's faculty of mechanical engineering. Even when the Second World War broke out, the European Holocaust, the global horror and the seeming end of civilization, the Schneersons continued to meticulously observe all Jewish laws and customs. For example, when preparing matzah, he did exactly as his father had taught him, with no concessions to the circumstances and no laxity in kashrut. Witnesses relate that he crossed the border into Switzerland, where he acquired wheat and ground it by hand. The Rebbetzin baked the matzah in a special oven built in their tiny kitchen for the purpose, while the rabbi supervised the procedure to make sure that every rule was observed. Naturally, this matzah was not meant for them alone. They distributed the matzah to scores of Jews, which naturally included his father, Rabbi Levi Yitzchak, who was languishing in exile in remote Kazakhstan. It is also said that the future Rebbe provided Hungarian Jewish refugees in France with matzah. For the Festival of Sukkot, Rabbi Menachem Mendel built a sukkah in his building's courtyard, next to his ground floor apartment. The journalist Tzvi Shefer recounts that time: "I arrived in Paris and began to look for a sukkah where I could eat the festive meal. During chol ha'mo'ed I met Rabbi Schneerson, and he asked me how I was doing. I told him that I was concerned that I had not yet found a place to have the festive meal. The Rabbi invited me to his sukkah. I was somewhat uneasy about accepting his offer, because I knew that in those difficult times having guests involved considerable problems. However, he insisted, and I agreed to come. The sukkah turned out to be very small, with barely enough space for two. It was obvious that my presence would deprive the Rebbetzin of the opportunity to share the meal with her husband. I felt terribly uncomfort­able, yet the rabbi behaved in a manner that made every­thing fall into place. I felt as if the walls of the sukkah had expanded, turning it into a magnificent palace. The Rabbi was seated across from me, uttering pearls of wisdom, and it seemed as if images of the patriarchs were hovering above his head." Though Rabbi Menachem Mendel studied physics and engineering in Paris, he actually spent a large portion of his time pouring over the Torah, and the secular sciences took a minor portion of his time. In this, as in many other things, the rabbi followed the example of the Rambam. A man who studied at the Sorbonne at that time re­counts: "Once during a break, Rabbi Menachem Mendel was sitting and studying the Talmud, while close by a group of students were excitedly discussing some issue raised at the lecture. Suddenly the rabbi lifted his head from the book and solved their problem in a minute. The students were simply flabbergasted, since they had seen that he was im­mersed in the Talmud throughout the entire lecture." In the summer of 1940, when the German army in­vaded France, the Schneersons managed to flee Paris on one of the last trains to leave before the Germans captured the city. They made it to Vichy, where they stayed from the holiday of Shavuot until the end of summer, when they re­located to Nice. Italian authorities administered the city, and many Jewish refugees found safety there, but here too, dan­ger lurked at every comer. Jews stayed indoors; there were frequent curfews. Despite all the perils, Rabbi Menachem Mendel endeavored to help the Jews in every way he could. In order to check into a hotel, a Jew had to prove that he had at least a hundred dollars - a fortune at the time. Rabbi Menachem Mendel always kept a hundred-dollar bill in case such a situation should arise. He would roam the streets, and whenever he spotted a Jewish refugee in need, he would give him the money. The Jew would then show the bill to the hotel manager, and later surreptitiously return it to the rabbi, who would immediately hand it to another refugee. The authorities issued a decree ordering everyone who had gold in his possession to sell it to the government. Anyone who violated this decree faced severe punishment. A certain wealthy Jew kept a large number of gold ingots. Knowing that Rabbi Menachem Mendel was above suspi­cion, the man asked him to hide the gold in his home. He consented at once. However, several days later the Reb­betzin began to fear the consequences, and urged her hus­band to move the gold to another hiding place. Rabbi Men­achem Mendel was adamant: "This is Jewish money, and it is our duty to ensure its safety." Immense efforts were being made to bring the Schneersons to America, where the Rebbe, Rabbi Yosef Yitzchak had already settled. France was totally under Nazi rule, and it was becoming increasingly dangerous for Jews to remain there. In order to arrange the Schneerson's move to America, supporters dispatched telegrams, placed transat­lantic calls, exerted pressure on the U.S. State Department, and, of course, paid a great deal of money. When the neces­sary papers were finally ready, the tickets were bought - and suddenly a telegram arrived from Rabbi Yosef Yitzchak: "Do not sail on the next ship." This was a very odd mes­sage; tickets were very difficult to come by, and it was not certain that there would be another ship. However, Rabbi Menachem Mendel, as always, obeyed his father-in-law without hesitation. When the Rebbe gives instructions, the Chassid does not question them and is fully confident that the Rebbe is right! The ship was indeed attacked by German submarines. Eventually the Schneersons did manage to leave France, and reached America via Spain and Portugal. Immediately upon arriving in America, Rabbi Men­achem Mendel immersed himself in work. According to reminiscences of Rabbi Leibl Bystritsky, the rabbi's day was divided into two parts: every morning at seven he left home and set out for the Brooklyn shipyard where he worked as a shipbuilding engineer. At three p.m., he came home and applied himself to his other work: his father-in-law had entrusted him with the management of the Center for Jewish Education, the Machaneh Israel, and the Kehot Publication Society. He did everything under the direct su­pervision and close scrutiny of the Rebbe, Yosef Yitzchak. Their unique relationship grew stronger day by day. Rebbe Yosef Yitzchak had one single Chassid who was perfect in every way: his son-in-law, Rabbi Menachem Mendel. In 1944, several months after Rabbi Levi Yitzchak Schneerson left this world, Rebbetzin Schneerson, Rabbi Menachem Mendel's mother, moved to Kraskovo, not far from Moscow. Her situation was far from encouraging. In order to reside in Moscow, or even in the vicinity, one needed a special permit, which the Rebbetzin did not have. She was living clandestinely, forced to spend each night in a different place. Given the poor state of her health, it was obvious that she could not continue to live this way. She managed to move to Lvov. It was at this time that the Lubavitch Chassidim succeeded in carrying out the now legendary scheme of using false papers to smuggle several thousand Jews into Poland. This was an unprecedented act of daring, the only one of its kind during the entire period of Stalin's regime. The Rebbetzin was one of the fortunate people who managed to flee the Soviet Union via this es­cape route. From Poland, she relocated to Paris in 1947. Rabbi Menachem Mendel traveled from New York to Paris to meet his mother, whom he had not seen for twenty years. The Chassidim who lived in Paris at the time would cherish the heart-warming memory of this meeting with his mother. The Chassidim arranged a farbrengen during which Rabbi Menachem Mendel started talking about Yosef, the son of our patriarch Ya'akov, who met his father again after a twenty-two year separation. However, as soon as he began to talk, he could not contain his feelings and he burst into tears. The Rebbetzin stayed in Paris for three months ­from Purim until Shavuot. During that time, Rabbi Men­achem Mendel visited his mother in the morning and in the evening. On Shabbat and holidays he would walk from his apartment to hers, pray at the nearest synagogue, and have the meal with his mother. During his sojourn in Paris, he would frequently de­liver discourses to eager audiences. His talks were novel, deep, and filled with simple and boundless faith, and inevi­tably concluded with practical advice. On one occasion, Rabbi Menachem Mendel came to a synagogue filled with people, among them prominent rabbis and mentors. Despite his youth, he already enjoyed enormous respect in the Jew­ish world. Rumors of his genius, incredible learning and pi­ety were spreading in increasingly wide circles. After min­chah, Rabbi Menachem Mendel asked the worshippers what topic they were studying at the synagogue, and was told that it was Ein Ya'akov (Ya'akov's Spring), a compilation of the non-legal parts of the Talmud. The Rabbi took the book, immersed himself in it for several minutes, and then deliv­ered a two-hour discourse based on the book, discussing the Passover Haggadah, Kabbalah, and Jewish philosophy. Af­ter ma'ariv he was asked to continue his discourse. At first he declined, but then, seeing that the people were sincerely eager to hear words of Torah from his lips, he agreed. Once again he asked what they usually studied following ma'ariv. When told that they studied the rules of tefillin from the Shulchan Aruch HaRav, he spent another hour speaking on that subject. When he finished, the synagogue elders told him that they were also in the habit of studying a chapter from the Tanya, and that they had just reached chapter 41. The Rabbi agreed once again. In conclusion, he fused the lessons from all three books into one integral whole. His lis­teners were simply amazed: they had never heard such a discourse before. They were particularly stuck by Rabbi Menachem Mendel's unique ability to find a common de­nominator in such seemingly unrelated topics, and to blend them together. In his discourse, the Rebbe had quoted hun­dreds of passages verbatim, without pausing for a minute. Hitherto familiar concepts suddenly acquired a new mean­ing, one that the listeners had not even suspected before. At the end of the lesson Rabbi Menachem Mendel rose and ex­cused himself, saying that it was late and he still had to visit his mother. Once Rabbi Menachem Mendel asked a member of the Paris Chabad community why they were not doing any­thing to spread the message of Judaism. The man replied that the atmosphere in Paris was not conducive to spiritual life. People had no interest in religion, and there was noth­ing to be done about it. "There is plenty that can be done," said Rabbi Menachem Mendel. "Come with me, and you will see how simple it is." They headed for one of the city's main streets, in a section with a large Jewish population. There, Rabbi Men­achem Mendel climbed atop a crate and began to wave a handkerchief. A crowd of curious people gradually gathered around him, and he began to talk to them, urging them not to forget their Jewish roots and to observe the command­ments. His simple and boundless sincerity, and his lack of pretension had their effect. His words stirred the listeners, even those who were far from Judaism. Many felt that they were rediscovering something infinitely familiar and close to their hearts, something that for some reason had remained hidden until then. Many of the people had tears in their eyes. After the Rebbe's speech, everyone joined in minchah. Many of the Jews had not uttered a word of prayer in years. On the eve of his departure, Rabbi Menachem Men­del led a farbrengen that lasted well into the morning hours. The Rabbi, his wife and his mother sailed to America. In New York, the Rebbetzin lived less than two blocks from her son. He visited his mother every day; he took an active interest in her affairs, and sometimes ate at her home. Even after he had assumed the duties of Rebbe and had to sched­ule every minute of his time, he continued his usual routine. He always kept a key to his mother's apartment in his pocket, in order to save her the trouble of opening the door for him. On Shabbat and holidays, the Rebbetzin would at­tend synagogue at "Seven-Seventy" [see chapter 8], and she would stop by to wish her son a good Shabbat or holiday. When the Rebbetzin left, the Rebbe would always see her to the door and watch her until she disappeared from sight. During the 1940's, the Chabad movement consoli­dated its position both in New York and in the rest of the United States. Those years saw the establishment of new synagogues and yeshivot. The Center for Jewish Education, the Machaneh Israel, and the Kehot Publication Society expanded the scope of their activities under Rabbi Menachem Mendel's leadership. The community was growing. All dur­ing that time, Rabbi Menachem Mendel continued working at the shipyard. On the 10th of Shvat, 5710 (1950), the Rebbe, Rabbi Yosef Yitzchak left this world. Since The Rebbe had no sons, Rabbi Menachem Mendel Schneerson, his son-in-law, was the natural choice for succession. However, to every­one's surprise, Rabbi Menachem Mendel adamantly refused to accept the mantle of leadership, meeting all entreaties with a firm, "No." Some people tried to pressure him into accepting the position by sending him notes with requests to say prayers for them. He would pray, give his blessings, and reply to all the letters, yet he persisted in his steadfast re­fusal to assume leadership of the Lubavitch movement. Months went by without any other suitable candidate being found. Finally, about a year after his father-in-law left this world, Rabbi Menachem Mendel accepted the title of "Rebbe." In this manner, without any official ceremony, Rabbi Menachem Mendel Schneerson became the seventh Rebbe in the Chabad dynasty. 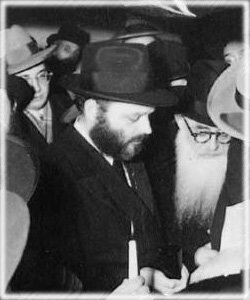 In 1952, in England, Rabbi Israel Aryeh Leib, the Rebbe's brother, left this world. He had been in the habit of sending his mother congratulatory telegrams on every holi­day. The Rebbe was afraid that the terrible news of his brother's passing would kill his mother. He therefore made sure that the telegrams continued to arrive, as if the de­ceased son were still alive. The Rebbe's love and tender care were a comfort to the Rebbetzin during the last years of her life. After all the terrible hardship she had lived through, she had the good fortune to see her son's wonderful achievements. Rebbetzin Chana left the world on the 6th of Tishrei, 5725 (1964); she was buried near the grave of her son's father-in-law, Rebbe Yosef Yitzchak.